Fish Em LLC is a veteran owned fishing guide company that started out as a passion and dream. For over 11 years, Travis and Lori have been fishing the Kenai River in Cooper Landing, Alaska during the summer months and ice-fishing local lakes in Eagle River, and Mat-Su Valley during the winter. A kid blessed to show people how to trick fish with a fly, respect nature, and rest in the Sierra Nevadas. Let me introduce to you a place in the heart of Europe which soon became loved by many fishermen from all over the world. The Czech Republic, and especially its Šumava region, is not only a paradise for fly fishing lovers but above all a place with beautiful nature that will embrace you and never let you forget it. The Šumava National Park crossed by the Otava river, offers unforgettable atmosphere, which is one of the reasons why our clients like to return here. The articulation of the river and its variability brings many fishing adventures and provides what we fishermen like most – a possibility to restore peace of mind, merge with the nature and find oneself. This is one of the origins of the idea to build Hotel Annin close to the river and give you all you look for here. In cooperation with my brother David we will prepare a programme tailored to your dreams and show you the best places on our rivers. I began fly fishing at the age of twelve and started fly tying shortly thereafter. However, my interest in fly tying peaked during my college years when I took several courses in aquatic entomology and as a result began tying my own patterns to better imitate the nymphs found in my local streams. I began fly fishing for trout and bass locally, then expanded to steelhead in the Lake Erie tributaries. About ten years ago, I travelled with a group of friends to Cape Cod, MA to fish for striped bass and blue fish and this sparked a continued interest in fishing forsaltwater species. In my home waters of Northwestern Pennsylvania I pursue trout, large and smallmouth bass, steelhead, northern pike, muskellunge and panfish. I also travel to the East coast to fish in saltwater for Striped Bass and Bluefish and In the fall of 2016 I travelled to Belize to fish for Tarpon, Snook, Permit, and Bonefish. I have been a member of the International Federation of Fly Fishers since 2002 and I am on their list of demo tiers. In the past I have tied at the Northern Ohio Fly Fishing Expo sponsored by the North Coast Fly Fishers and also the last five years at Lefty's Tie Fest at Kent Island, MD. I have also tied the last three years for the Chesapeake Council of the FFI at their booth at the Lancaster Fly Fishing Show. I am currently a Fly Fishing Skills Instructor for the Pennsylvania Fish and Boat Commission. I am also an FFI Certified Casting Instructor. I offer both fly tying and fly casting instructions to interested individuals. 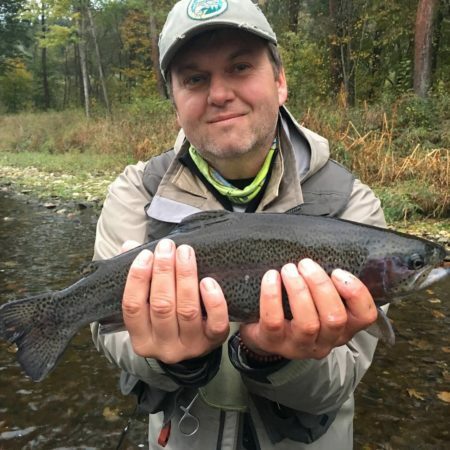 Kevin is a self-taught fly fisherman and tyer currently living in Pittsburgh, PA. His passion for all things fly sparked when he found his grandfathers old fiberglass rod and cork poppers at a young age. Summers of harassing local bluegill and bass has transformed into fishing and tying to follow the seasons, including steelhead, warmwater, predator, and trout flies. Kevin is currently the Content Director for Hatches Magazine, member of the Regal Vise Pro Staff, and scheming his next trip. An avid fly fisherman and fly tyer for over 50 years. A master fly tyer with extensive knowledge of entomology. Dimitri's specialty are realistic flies. His favorite fish would be trout and Atlantic salmon. Dimitri has fished across Canada, United States and Europe. He is a member of the Izaak Walton Fly Fishing Club in Mississauga, Ontario. He has held a number of fly tying presentations demonstrating his skills and extensive knowledge of flies. When he is not by his vise, you can find him on one of the river banks of Southern Ontario. My fly fishing and fly tying started in 1990. My passion in fly tying goes out to the realistic flies, including fishable and art flies. With more flies then I could ever fish with, I needed a new challenge in fly tying. I tried a few things like the classic salmon flies but could not get the satisfaction. Until I came up with the realistic fly tying, that was totally my thing, spending many hours on a single fly. It is to me a big kick to recreate a bug as good as possible. For some flies, I've spent more then 40 hours of tying, but when the end result is finished it gives me a great satisfaction. I spend many hours behind the vise, tying is sometimes even more important to me then fishing. Every day I am behind the vise, trying new stuff and trying to improve my skills. South Island Fly Fishing at its best! Front luxury log cabins with world renowned fly fishing guides at this specialty brown trout fly fishing luxury lodge. River Haven Lodge is an “All Inclusive” lodge with a full breakfast and three course dinners served in the main lodge and a garden fresh healthy picnic lunch served on the river with your guide. Stop in the River Haven Private Bar after fishing for a cold drink and great bar food, as well. All is included in one price (even house wine and beer! ), to put your focus on your main interest, to catch brown trout! Fresh water trophy brown trout fly fishing with experienced, friendly fly fishing guides! Scott Murray, better known as “The Trout” around the world has become famous in his own right as a renowned brown trout fly fishing Guide. He leads River Haven Lodge’s fly fishing team of Guides, considered to be one of the friendliest, and most experienced in the country! In River Haven’s Guiding Team, all our Guides have between 15 and 25 years of experience guiding for the Top of the South Island of New Zealand. Their experience and knowledge are beyond measure. Your top choice resource for fishing Southern Poland rivers! Przemysław Półtorak is a professional fly fishing guide located in Southern Poland. He started fly fishing as a child on the beautiful river Bialka Tatrzanska. He actively competes for Polish Fly fishing team. He is active in conservation of the southern Polish rivers and participates in many fishing programs on the Polish television. He is also an editor of the biggest magazine for Polish fishermen. If you would like to fly fish southern Polish rivers we would highly recommend using his professional fly guiding services and learning some Polish nymphing techniques. ‘Balkan’s Fly Fishing Paradise’ – your main fly fishing resource for this part of the world! Musicarenje.net is the biggest and most visited web portal on the Balkans that is exclusively specialized in fly fishing. This is the place to go to for the information about rivers and streams of the Balkans, various fish species that can found here, flies selection, fishing licences, guiding services, fly fishing tours, fly fishing clubs, fly tying competitions and so much more. If you are planing a fly fishing trip to this part of the world – this would be your main resource. An excellent resource for fly tying videos and instructions for all skill levels! Tim Cammisa lives in western Pennsylvania and has been tying flies for over 25 years. His fly fishing has taken him all over the country, with his “home base” being in the State College area. Married to his wife, Heather, the two can be frequently found on outdoor excursions (both with and without their two dogs!). When not tying flies, Tim also spends some of his free time building bamboo fly rods. Tim started making fly tying tutorials on YouTube a few years ago, and has quickly grown an audience of 7,000 subscribers with over 700,000 video views. You can view those videos on his website, Trout and Feather. A real master fly tyer, Jim Misiura shares his fly tying, fishing & guiding expertise & skills! A top notch fly fishing & fly tying resource center! 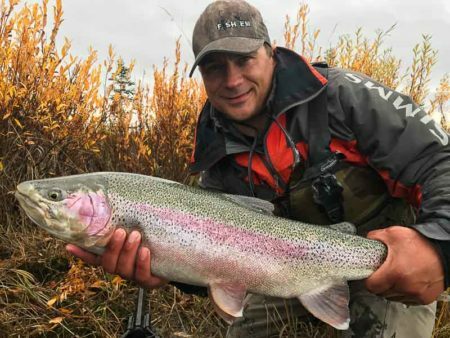 Here you can find the best fly fishing techniques, tactics and strategies. For fly tying tips, best fly patterns, countless ideas on how to use fly materials and choosing the right fly – Jim provides all this and more through his educational videos and articles. Jim has been guiding on rivers and streams of Northwestern Pennsylvania for more than 20 years, Lackawanna River being his main water for guiding. He is the only guide in N.E. Pennsylvania with 40 years experience fishing the river. Weather it’s big brown trout, rainbow or mountain stream brook trout, Jim can fit a fishing trip that is sure to please!